“It’s invaluable,” he said. “They can see what they’re learning in school being applied every day on a job of this size. The tour shows them a little bit about what’s going on in the trade and in other trades – how people work side by side. The NIHP has been providing jobs and experience in volume. Employment numbers peaked in April with a total of 1,008 people working on the two hospital construction sites, including 290 apprentices. 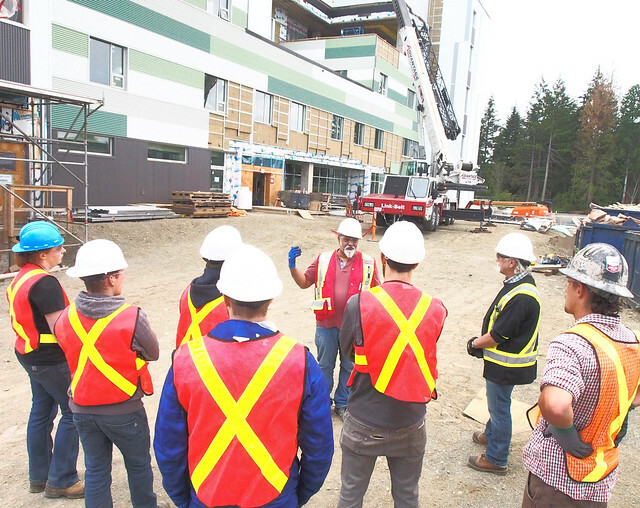 Klatt and students toured the site with Nazz Russo, Graham’s Comox Valley Hospital Site Superintendent. Russo agreed it’s been very handy to have students training so close to the construction site. “I wish all the best to all of them, and that this is a career that they decide to stay with,” he said. Graham’s Health, Safety & Environment (HSE) Supervisor Michael Brown made the students’ tour possible by first providing them with a site safety orientation. More than 2,000 safety orientations have been conducted since the North Island Hospitals Project began. Brown said it’s important to establish safety as the top priority on site from the beginning. “A strong start is having the right training and mentorship from the first day when it comes to safety, whether that means starting an apprenticeship program at NIC or the first day on the project,” he said. “The students benefit from having Klatt as a strong mentor at the school. In addition, new workers are initially paired up with a more experienced worker or journey person until deemed competent to work safely by their supervisor.